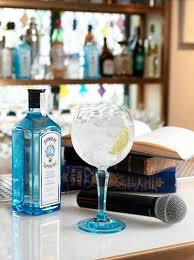 Until November 2013, those with a thirst for knowledge will be delighted to learn that Sunday Wise, the cerebral Sunday lunch experience, will partner with iconic gin brand Bombay Sapphire to deliver a unique series of monthly events. Taking place on the last Sunday of every month from 12:30-5pm in the exclusive surroundings of The Club at The Ivy, Sunday Wise is for those who like to ‘think while they drink’. Created by Hamish Jenkinson, Director of The Old Vic Tunnels, the specially curated afternoon begins at 12.30pm in The Loft with guests enjoying a classic Bombay Sapphire ‘Ultimate G&T’ on arrival while listening to an eclectic mix of speakers who are all leading commentators in their field. The next event, on Sunday 30 June, is themed around art and science with a thrilling line up of speakers confirmed including Lord Dalmeny, Chairman of Sotheby’s and the photomontage artist Peter Kennard whose work is in many major collections, including Tate and The V&A Museum. He will be joined by Stuart Clark, the acclaimed author, journalist and broadcaster who writes the Guardian’s online blog, Stuart Clark Across The Universe, and was previously senior editor for space for the European Space Agency until 2012. The speakers will debate topics and discuss current affairs from the week, before some inspirational words or street poetry are given from a chosen artist. Lunch is served in the informal surroundings of The Piano Bar with entertainment provided in the form of some slinky pianists and talented vocalists. Guests return to The Loft after lunch to experience some of London’s freshest comedy talent. Guests will be greeted on arrival with a Bombay Sapphire ‘Ultimate Gin & Tonic’. The classic combination of Bombay Sapphire, Fever Tree tonic water and lime wedges over ice will be served in one of the new Bombay Sapphire balloon glasses. The bowl shape of the glass delivers the ultimate gin drinking experience by trapping in the aromas of the 10 key botanicals, allowing the flavours to linger and give a more intense flavour.